Bill Bryson is a travel writer, one whose books encompass everything from geology to history as they record his roaming in all sorts of places. 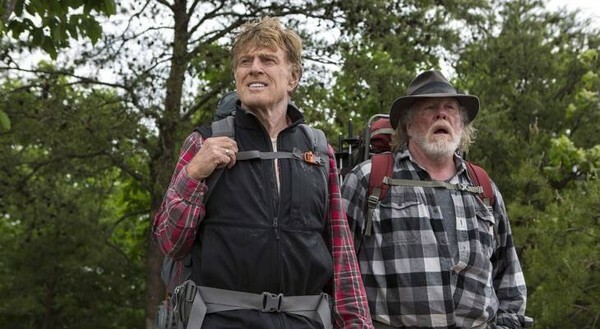 “A Walk in the Woods” is a film adaptation of his book of the same title: the story of his hike of the Appalachian trail with one of his oldest friends. Like Bryson’s books, the film has a little bit of everything – a little philosophy, a little existentialism, a little comedy, a little romance, all mixed together just so, with some adventures thrown in for spice. It’s a fun film with a solid cast. As played by Nick Nolte, Stephen Katz is the kind of guy you tend to lose touch with, who has accomplished little but adding lots of notches to his bedpost over the last few decades, and who has spent at least half his life thoroughly drunk. He hears about Bryson’s attempts to find a hiking partner (all of his other friends wisely turn him down) and calls the man up to ask if he can come. Bryson (an affable Robert Redford) reluctantly agrees, and their interplay is a big source of humor in the film. Bryson has a loving wife, several children, and a few grandchildren. He lives in a big old house he loves and sees his family all the time. By all standard measures, his life is pretty much perfect. Katz, on the other hand, has pissed most of his life away, and he has the wrecked body and lack of social network to show for it. As the two make their way slowly up the trail from Georgia, they encounter interesting characters (Kristen Schaal makes an appearance as the most annoying person she has ever played, which is saying something), amazing views, and the occasional moment of terror. At one point, two bears enter their campground, and neither of the men can remember what you’re supposed to do for this type of bear. Fortunately Bryson has a book on hand to consult, and the results are as funny as they are exciting. There are also, of course, the kinds of existential conversations older guys like this get into – circuitous, indirect, and careful; at least until one of them loses his temper. Nolte and Redford slip seamlessly into the two halves of this strange friendship, and make it easy to see how Katz and Bryson were once close friends but now barely know each other.